I reckon Japanese udon is the best light meal for my family through out the year. It’s quick to whip it up in the last minute. 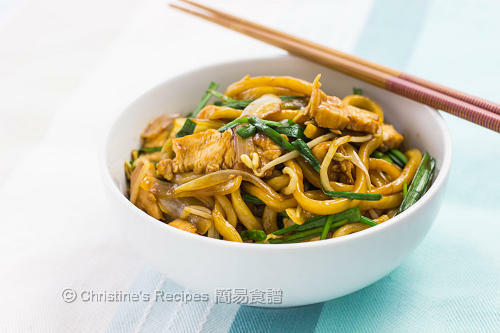 By stir-frying the noodles with teriyaki sauce, it’s heavenly tasty. My family loves udon very much. So I’d keep a packet of frozen udon in the freezer. Simply blanch the noodles in boiling water for a short while. It’d be perfect for stir frying. What you need is to add some meat and seasonal vegetables. You can marinate the meat well ahead and keep it in the fridge. A healthy and tasty udon dish will be finished within 20 minutes. Marinate the chicken with at least half of the sauce. The chicken should be covered evenly. Set aside for about 30 minutes. Heat oil in a frying pan over medium heat. Fry the chicken until both sides are lightly brown. Pour in all the marinade. Cover and cook the chicken over low heat until the chicken is cooked through. Dish up and let it rest for 10 minutes. Cut into thick slices. Set aside. Add a little more oil into the pan. Increase heat to high. Saute onion until transcalent. Add the bean sprout. Stir to combine. Add udon noodles. Stir and cook until heated evenly. 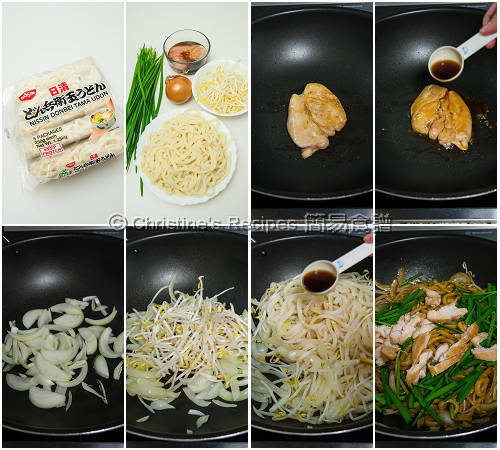 Along the way of stir frying the noodles, add the cooked marinade bit by bit and combine well. You might not need to add all the sauce. Toss in the chicken and chives. Stir and cook until the chives are just cooked. Test the taste. If you’re satisfied, it’s done. Serve immediately. As the marinade contains sugar, don’t use too high heat to fry the marinated chicken, because you don’t want to burn it. 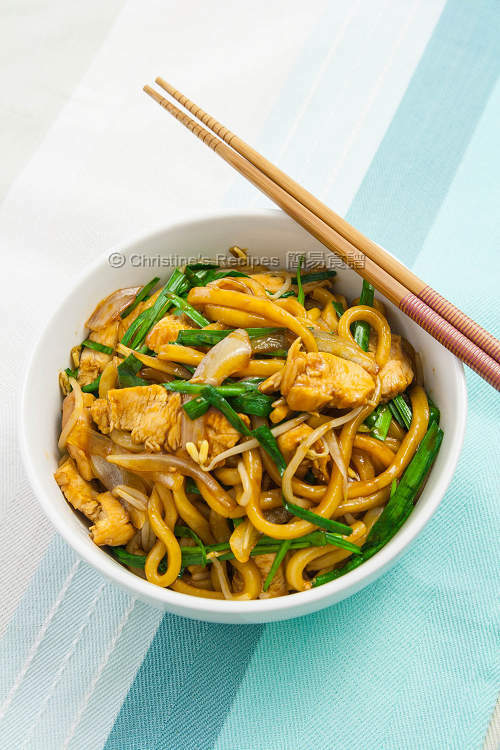 The quantity of cooked marinade to fry noodles depends on your personal preference. Mirin is a popular condiment used in Japanese cuisine, available at Japanese or Asian grocers. This is so tasty and appetizing. Teriyaki makes this noodle stirfry extremely flavourful. So happy to find your blog. I host Asian students and have fallen in love with the food. I currently have a wonderful Japanese student; so there is lots of reason for me to cook your recipes. Thank you. I'll try your Teriyaki soon. Should your Marinade be "rice wine vinegar" and not "rice wine" as I thought mirin is rice wine already? Thanks if you could clarify please. I did use rice wine, not vinegar to marinate the chicken. The meat shouldn't be tangy at all. The alcohol in mirin is not that enough. Thanks Christine! I made it and it was delicious! The kids just loved it. I've made many of your recipes now and am so grateful for your easy to follow recipes with amazing results. Thank you for sharing them! Great to hear that your kids loved it. Your feedback is very encouraging. Welcome you to come back for more. Hi Christine, is the Japanese rice wine the same as Japanese cooking sake? I am unable to find rice wine where I'm staying and I was hoping I could substitute with sake. Yes, it's a kind of sake. You can use any sake at hand to make this dish. No problem at all. What is the dark soy sauce? Is that the chinese "Lo Chau?" Can I substitute the Japanese soy sauce with our chinese light soy sauce? Yes, dark soy sauce is "lo chau" 老抽. Feel free to substitute with whatever soy sauce at your hand, and adjust the quantity as well. Happy cooking! Hi Christine, I would love to try recipe but not able to print the printable version. There's error loading the page. Please help. Thanks. Thanks for letting me know. Sorry about the link error. I've fixed it already. It should be fine.